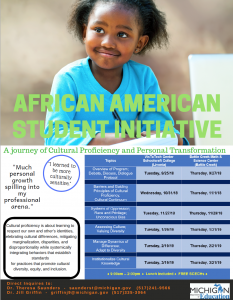 The Michigan Department of Education is launching Cohort 3 of Phase 1 of The African American Student Initiative (TAASI): A Journey of Cultural Proficiency and Personal Transformation. Schools are invited to participate in this 6-session professional learning opportunity. Who: School level teams of three or four people (i.e., building leadership, teacher/teacher leader, counselor, nurse, parent/family liaison, etc.). Please note that superintendent support is required at time of application. Cost: Registration is free for schools that are one of the listed as Comprehensive Support and Improvement (CSI), Targeted Support and Improvement (TSI) or Additional Targeted Support (ATS). All other registrants will be required to pay a fee of $20 per person per session.